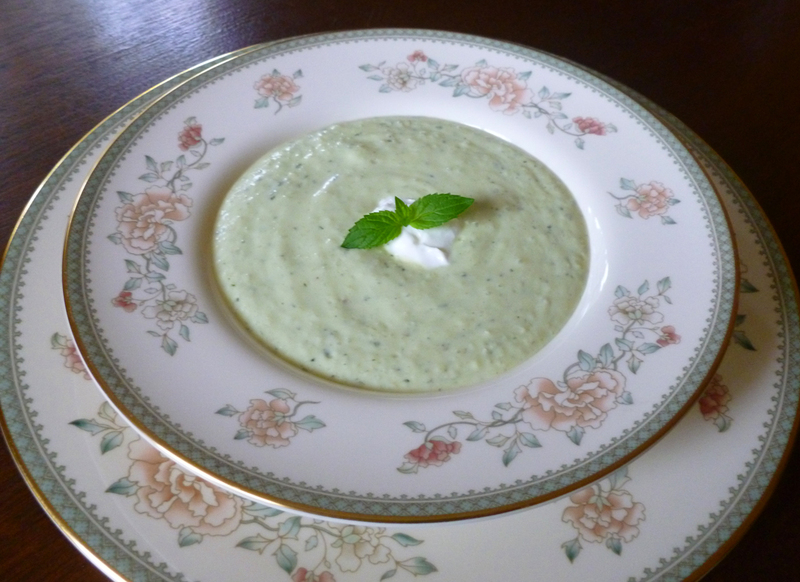 Elegant and easy, this cold soup has been a staple in our house all summer long. Such a staple that I whirr it up in the blender at least every other week. We gobble it up in no time flat, and then want more and more. In fact, it’s been relegated to the status of something so simple and quick to make that it’s almost like making a peanut butter and jelly sandwich…almost. But it really deserves a bit more attention than it’s gotten thus far. I posted the base of this soup when I first started this blog, but since that time I’ve made it so often that I could make it in my sleep! And I think I’ve perfected it now. Cool and creamy, fresh tasting and rich…and dare I say it? Yep, it’s healthy, too. A perfect accompaniment to just about anything, and I know this because we’ve paired this soup with sandwiches, fresh tomato salads (yum), coucous and other grain salads, entrees, grilled foods, fruit salads, appetizers…you name it. But it’s also terrific just by itself for a light lunch on a hot day. It would make an elegant and impressive first course to any dinner party, too, which is something I need to remember for my next one. Give this recipe a shot and I think you’ll find that it becomes a favorite and a staple in your home, too. And hey all you cooks and food fans out there, guess what? Julia Child’s 100th birthday would have been next Wednesday, August 15, and all over the world folks are paying tribute this week to the icon that was and is Julia. To celebrate and just for fun, I’m issuing an invitation/challenge on my Facebook page to choose and cook one of her dishes during the week leading up to her birthday, in particular a recipe from her “Mastering the Art of French Cooking” cookbook. Once you have your dish made and plated, take a picture and post it on your own Facebook or blog page as a happy birthday salute, then share it as a friend on the Bits and Breadcrumbs Facebook page. It’ll be fun to see what everyone chooses to make and how it comes out, and a lovely way to honor one of the greatest cooks of our time, and a hero of mine. You can “like” Bits and Breadcrumbs on Facebook by clicking the Like button next to the Facebook Like box on the Home page of this blog, or you can follow this link and like it here. I’ll be posting a dish or two myself, of course, so stay tuned for the next post and the first of my “Salute to Julia” dishes, and I hope you’ll join me in the fun! In the words of the Grande Dame herself, Bon Appétit! Worthy of a special occasion…like dinner! I usually just prep each item and throw it in the blender as I go…see? Easy! Put all ingredients into a blender, put the top on and pulse to chop the ingredients, then puree until you have a smooth and creamy soup. Taste for seasoning, and add more black pepper or more lemon juice if desired. Transfer to a bowl or jars and chill in the fridge for 30 minutes to an hour. Serve plain or with a small dollop of plain yogurt and garnish with mint leaves. Keeps well in the fridge for 3 days if you don’t eat it all right away! For a tasty and even healthier variation, you can add 1-2 cups of fresh whole baby spinach leaves and about 1/3 cup more chicken stock or buttermilk. Green and good! This entry was posted in Soups and tagged Avocado, Cucumber Soup, Easy recipes, food, Healthy Soups, Julia Child, mastering the art of french cooking, Quick meals, Vegetarian by bitsandbreadcrumbs. Bookmark the permalink. I love avocados and have one on my counter right now. Everyone is posting avocado soup recipes and I’ve never had one. I think I should change that as soon as possible. I like the idea of adding cucumber and mint…sounds great. As I was reading the list of ingredients I thought, how would it taste with 1- 2 tablespoons of sherry added to it. or a dash of cognac? Hmm, I don’t know. But I’m all for experimenting! I might make it, taste it, then try adding a bit and see what you think…they sherry particularly intrigues me. It definitely takes the edge off the heat, and I’ll bet you have cucumbers in the garden, too! Oh dear. Can’t do avocado. It sure looks pretty though. You’re in luck! My original recipe didn’t have avocado in it, so just leave it out…maybe add some spinach if you’d like! The texture is slightly less creamy without the avocado, but the soup is still great! Oh good! Spinach I like. 1-2 cups of fresh baby spinach leaves…we’ve had it that way and it’s yum! Thank you Uru, it does have a beautiful green color at that! I can see Julia (in her younger days) sticking her spoon in that bowl and eating every bite. It looks really good. I adore chilled avocado soup, and your variation sounds incredible, Betsy. What a wonderful addition to a dinner party. I love your idea about Julia, I am going to grab my Baking with Julia Cookbook and make something this weekend! Such fun is this going to be! Not sure why but I have never made or eaten an avo soup before – your’s looks and sounds fabulous. Betsy, love this soup recipe! I just had an avocado and leek soup on the islands but the addition of cucumber and mint sound divine! I’m making this recipe this weekend, it’ll be a hot one and this will be perfect. Thanks! Let me know if you try it and like it Karista. It has a little kick to it with the raw onion, garlic and the habenero…kinda balances the cool of the cucumber and avocado. Have a super weekend! Ooh, I’ll have to break out my copy this weekend! And your soup looks delicious! I have an avocado soup that I like to make, but I wouldn’t have thought to add cucumber to it. I love the sounds of this soup Betsy. I’m adding the ingredients to my shopping list this weekend. This is one soup I’ve never tried. I must admit, though, Betsy, your description makes me want to get to a market and start selecting the ingredients. It really does sound delicious and maybe it’s because of the mint green color but it sure does look refreshing, too. It tastes as “green” as it looks, John…in a good way of course! 🙂 It’s really a lovely soup. Has a little tiny kick from the raw garlic, onion and pepper sauce, too. I have never tried an avocado soup before but your description is making me hungry! It’s very cooling on hot days, Jed, and that’s why I’ve made it every other week this summer! 🙂 It helps! Hi Betsy – I personally wouldn’t want to add any cognac or sherry to the soup, as Norma suggested. Sherry goes amazingly in chicken soup, but I think I’d find it too much in a cold soup. I’m not a big fan of booze anyway, so just as it is with plenty of lemon juice would be perfect! It sounds lovely! 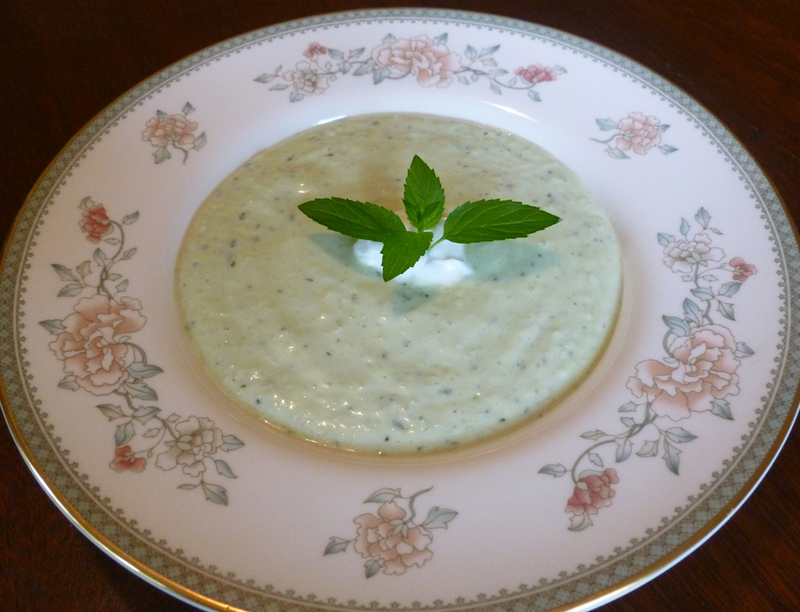 I have tried cucumber soup, but because I was lazy and didn’t peel it it didn’t turn out too tasty. But soup with avocado?! Sound amazing!